If you are looking for the modern RuneScape guide for this content, please see our Family Crest guide. The Fitzharmon family crest has gone missing, and the family honour has been lost. Can you find the crest and return it to Dimintheis in Varrock? There are three different rewards available, but you can only choose one; so choose carefully! To Begin this Quest, Speak to Dimintheis. 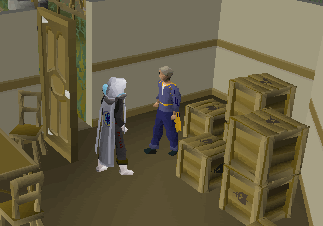 He is located in the house in Southeastern Varrock just north of the Fancy Clothes Shop. First off, talk to Dimintheis, found in a house next to the Fancy Dress Shop in the southeast corner of Varrock. He says that his Family Crest is missing, and that he needs your help to get it back. Tell him you'll try and find it for him, and he mentions that his son Caleb is a cook living beyond White Wolf Mountain. Now head to Catherby, where you can find Caleb in a kitchen just northeast of the bank. After asking him if he's really Caleb, he'll tell you that he has part of the Crest, but he isn't going to give it up easily. He wants you to bring him some cooked fish for his salad, including a Swordfish, Bass, Tuna, Salmon and Shrimp. Bring these back to him for his Crest Piece . Now ask about what happened to the rest of it, and he'll say that he and his brothers got into a fight and each took a piece of the Crest. He will also tell you that his brother Avan is hunting for a treasure in the desert. Go to Al Kharid and talk to the Gem Trader about Avan. The trader says that Avan was looking for 'Perfect' Gold, so head to the mine to the north and talk to the man wearing a yellow cape. He says that he'll give you his piece of the Crest if you make him a necklace and ring made of Perfect Gold with rubies in them. He also says that a Dwarf named Boot may know where to get Perfect Gold. Pull the lever to the north up and go into the room to the south through the left door. Pull the lever on the east wall up, and exit through the opposite door. Pull the lever to the north down and go into the north room. Pull the lever on the north wall up, leave the room and pull the lever next to the door up again. Head back to the south room, pull the lever down and now you can enter the room to the east. Inside the room should be several Gold rocks, along with 2 level 122 Hellhounds, but usually the hounds are being killed by Rangers. Mine 2 pieces of 'Perfect' Gold Ore, leave the dungeon and then smelt the ores into bars. Now Craft the bars into a 'Perfect' Ruby Ring and Necklace, and bring them to Avan for his Crest Piece . He'll also tell you that his brother Johnathan is probably in an inn near the Wilderness. Head to the Jolly Boar Inn with an Antipoison Potion and go upstairs to find Johnathan, who seems to be poisoned. Use the potion on him, and he'll tell you that the Demon Chronozon has taken his piece of the Crest. Ask about the Demon, and he'll explain that you must cast each of the Blast spells to kill him. Now head to the Edgeville Dungeon, with your weapons, armor, food, Antipoison Potion and Runes for each of the Blast Spells. You'll need level 59 Magic to cast Fire Blast, but you can use a Wizard's Mind Bomb to boost your level from 56 to 59. You can buy 1 in the Falador Pub. Head past the Skeletons until you reach the gate leading to the Wilderness Dungeon, and then go inside. Run west past the level 10 Thugs, north past the level 13 Chaos Druids and through the gate. Head southwest past the level 172 Black Demons until you reach the gate to Chronozon and several level 64 Poison Spiders. Attack Chronozon, and you'll need to use each of your Blast spells once before you kill him or he will regenerate. After killing him, take the last Crest Piece . Now that you have the 3 pieces, use any piece with another to put it back together. Bring the Crest back to Dimintheis to complete the quest. Optional: Bring the Steel Gauntlets that he gives you to 1 of his sons to enchant them. Caleb will enchant them into Cooking Gauntlets, which makes you burn less food. Avan gives you Goldsmith Gauntlets, which give more experience when Smithing gold. Johnathan makes you Chaos Gauntlets, which make you hit harder with Magic. Family Guantlets - can be Enchanted by any of the brothers.